We are looking forward to our fall season, with new art events, in our same location at 2890 E. Skyline Drive Ste 180 in Plaza Colonial ( next to the copper dome ). **A long time admired and appreciated gallery artist Santos Barbosa is being honored by the Friends Of Western Art as their Artist Of The Year - 2017, at the Mountain Oyster Club on October 21st. Please stop by this first weekend in November from 10-4pm to see new work by these great gallery artists, meet & greet them, and watch them demonstrate their styles. Hot cider & fall treats accompany this unique weekend event. Contemporary artist Brad Stroman presents his popular new abstract / realistic acrylics and Sean Wallis will display classical romantic landscapes of the southwest and Italy. This October 8th full moon finds me getting ready for our return to our Tucson gallery next week. Its been a great, interesting, exciting and fun artful summer. What weather! 75 and up these January days give me an excuse to swim and enjoy the lovely springlike "winter"? 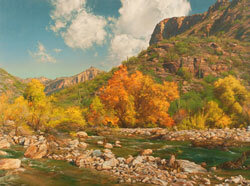 Tucson is a lovely city full of culture and activities especially during the snowbird and nice weather season. We Look forward to the Annual Gem & Mineral Show opening this week. Its been a hectic fall this year at the gallery……. Our 1st event was the beautifully emotional dedication on October 6th at St Odila Catholic Community of the Christina Taylor Green Healing Garden. This yearlong project by sculptor Mark Rossi, Father Richard Troutman and inspired by the late Teresa Biel's has been very rewarding. The great bronze piece of Jesus holding a dove with Christina Taylor Green, now sits in front of St Odilia Catholic Church on Paseo del Norte ( next to Tohono Chul Park ) in NW Tucson. Outside amid the mesquites people can sit and reflect on the beautiful but short life of Christina Taylor Green. It has been an honor to participate in commemorating the lives of the fallen victims of the January 8th 2011. The pavers surrounding the bronze in memory of loved ones, were designed by Chuck Paternini and complete the lovely area. Next we celebrated the "Jaguar Jamboree" a fun night raising several thousand dollars for the Northern Jaguar Project. This non- profit group has created an animal preserve in northern Mexico where the beautiful creatures run free. Diana Hadley as president of the Northern Jaguar Project was aided by music of singer / songwriter Kevin Pakulis, a Bacanora tasting, donations from Whole Foods, sponsorship of Royal Jaguar, The Jaguar Car Club and a cast of volunteers. A beautiful painting by Barry Sapp was raffled off at the "jamboree" the evening of October 25th when the lucky raffle ticket was drawn. Hundreds of people came to learn more about the endangered species, and donate monies toward their future livelihood. We were blessed to be of help, and we had a great time seeing our collectors and meeting new friends ! As we prepare for our 21st Anniversary "Simply Southwest" opening on March 22… not only have I reflected on the time gone by, but coincidentally its National Appreciation Week . We are encouraged to send notes of appreciation to important people in our world. There are two precious people I need to acknowledge as my new gallery year begins. After my horrible bout with the flu this January, and more sadly the passing of these two dear friends both on January 19th. This November finds me back in the 80 plus degree world of a "fall weathered" Tucson and unpacking in a new living space. The past month has been a real challenge as I tried balancing the sorting the emotional memorabilia of my now grown children, and my business history into the assorted piles of give away, throw away and bring along "keeper" categories. Whoever said one should move every 5 years was probably right ! We accumulate everyday the little sentiments of life, that somehow get mixed in with the junk mail that finally gets tossed . I have decided that moving my home is the "emotional homework" for me this fall, as I move from the Mom's "free storage unit"…. that was loosely called my garage, to my own present life. Here, the beautiful clutter of my children's favorite books and music boxes, have given way to a much quieter place I now call home. Come see our new show " Four Fabulous Faces of Fall" . November 30 through December 10th. ARTIST"S RECEPTION : Friday November 30th, 5-7pm. Please drop by to say Hi! to me and meet the artists. We are open every day . Sundays 9-2pm Monday through Saturday 10-6pm with extended hours on weekends. Zulia Gotay de Anderson who's oil figures of women are both strong and sensual. Sean Wallis "Traditional Beauty" oil on canvas in a beautiful relaxing setting. Well, I never thought I would be writing this entry.... Actually 20 years ago I didn't even have a computer, or a website, an email address or a cell phone!! 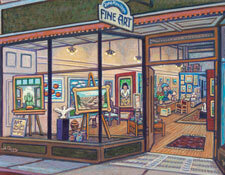 See me here in Bisbee artist Judy Perry's rendition of my Main Street Bisbee gallery! a 20 year artist in my gallery is being honored by his 1st ONE MAN SHOW " The Sky's The Limit" ! 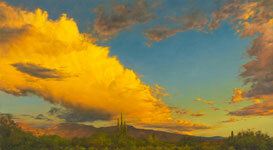 This terrific show of the fabulous lands and skies of Arizona is not to be missed! Our show title and spirit captures both the heights we have climbed these two decades together, and Tom's incredible paintings on linen of the always dramatic and ever changing place of Arizona! I can hardly believe that I am entering the 20th season of my own art gallery…. from our sweet tiny space on Subway Street in historic Bisbee, to our big luxurious location in Plaza Colonial at Skyline and Campbell…. we've come a long way baby !! I can't say time flew by, more like each year was a new step of its own, in the dance to where we are now. When I opened my gallery, I was a divorced single Mom raising my four children! I had the ideals of a third world micro entrepreneur woman which was to feed and educate their children . I would also add , I wanted to keep them with me at work, after school, or stay home if someone was sick, and eventually travel to help them find colleges …… without some boss saying, "NO, YOU CAN'T TAKE OFF" !! I had already had worked in New Mexico and Arizona art galleries, both good and bad for 13 years prior, so I guess... I thought I could make it go…. but the truth was... I just wanted to do it, and succeeding was the icing on the cake ! Now that my children are all grown and living their own lives, I realize that by being part of the art world, all of us gained .We gleaned from the artists, the collectors and many gallery friends, that we were an important part the community in which we lived. As much as I enjoy my vocation as an art dealer, I am also keenly aware in our changing times, how we help keep the culture alive. Sometimes I comment to a new collector "Thanks for voting for the culture!" Every time you purchase a ticket to a play, concert, opera or purchase a piece of fine art you vote for a culture to stay alive. And since I'm now navigating my 2nd or 3rd recession in a precarious business. My party line is still the same. When you invest in art your enjoyment of everyday life is enhanced. The best investment for anyone is not about money but beauty . I am grateful and thankful for every artist, collector, friend and family member that are a part of this seemingly impossible venture becoming the success it is today. And, most importantly I thank God for the opportunity to live out my dream. The LONG hot summer is finally almost a memory. This years seemed especially hot for Arizonans. I just returned from what I am now calling my Santa Fe Summer Sabbatical…. I actually took a 5 month getaway to the Land of Enchantment where I revived, regrouped and renewed my focus on life. I enjoyed the people, the weather and the art, not necessarily in that order. And, I came back with a few pretty talented new artists toad to our gallery. My daughter Sarah gallery sat for me during these Sizzling Summer Siesta Hours….But we are back to regular hours now of 10-6pm Monday-Saturday Thursday ART WALK 5-7pm and extended hours on weekends. ... And while I was busy eating hot red and green chile in Santa Fe, and enjoying the lovely wispy clouded summer days, my gallery in Tucson was getting a sizzling face lift.... New carpeting and three color palettes on the walls have created a great new dramatic, yet beautiful space to display art. Please stop by to see me and the "new gallery face" this fall. I am looking forward to a great season our 20th to be exact ! WOW ! Our first show this season "Four Faces of Fall" features four oil painters all using different styles and techniques in this fabulous show. 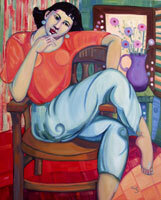 Zulia Gotay de Anderson brings the relaxing yet colorful portraits of women to he widening group of collectors. .Barbara Rudolph is bringing enchanting birds and music along side books in her oils this fall. And our youngest gallery artist, Sean Wallis will bring new vibrant impressionistic paintings of romantic courtyards and florals . I look forward to meeting all of you this season. I feel blessed as we walk toward our 20th season, I thank God for my success and my loyal artists and followers…. These last 6 months have really flown by….Our January show of Charles Pabst "Arizona Treasures" and Fred Wackerle's ART WINE MONDAY were fast eclipsed by the terrible shooting on January 8th. It was scheduled as an artist demonstration day, featuring sculptor Pokey Park. Because of that my son Joseph and I met at the Safeway Shopping Center, for a Beyond Bread breakfast. On his day off, Joseph had agreed to unload the heavy clay from Pokey Park's car. I had left just seconds before, but my son Joseph hearing the shots fired, while on an errand in Walgreen's ran toward the bullets, and helped keep down and subdue the shooter, until the police arrived. The next time I spoke to my son Joe Zamudio - Tucson Hero,( see News and Events page ) it was to hear him tearfully ask me to pray for the little girl who had been shot. Christina Taylor Green was her name. He said our Congresswoman Gabrielle Giffords and several other people had been shot. A fast prayer group formed in our parking lot at Campbell and Skyline, as neighboring businesses joined hands. This horrible experience changed Tucson, and our family . We grieved with the families of the lost, and prayed and cried with other first responders and survivors families. The rest of our season is a blur… We had lovely shows like Martha Braun and Leigh Gusterson's "It Only Takes A Moment" based on a painting by Leigh of a rural New mexican Church, encouraging us to stop and pray while we go on about our lives….. In March our 19th Anniversary Show featuring Barry Sapp, Blanche Davidson and Doug Shelton brought "Western Ways" in three different western styles. Native American and cowboy watercolors, gouache whimsical Mexican themed and thoughtful spacy trump l'oiel . We also hosted three shows in April. We exhibited the "art lunch boxes" for Ballet Tucson's Urban Picnic fundraiser. The following night as part of the Tucson Glass Festival he held the "Southwest Glass" show featuring Lee Augst new southwest themed fused artwork. 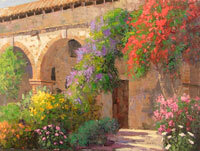 And finally on April 29th George Bodine returned this year for his "Romantic Italy" show. Several of these great classical realistic oils of Italy, have gone to new homes. A new glass artist to the gallery Karl Rossi gave us our last May 9th ART WINE MONDAY . These fun "cowboy glass hats" sat alongside his more contemporary works, at the beautiful Tavolina's, where a lovely Italian wine tasting and gourmet snacks made a festive evening. Today, June 8th while I reminisce on last season, I am reminded that 6 months ago a very sad day. Please keep those families whose loss was their loved ones in prayer. My son, Joseph has taken a great getaway to Colorado, to cool off and to see his sisters. The gallery has moved to Summer Siesta Hours 10-2pm and 5-8pm Tuesday-Friday. Saturday10-8pm. And, I am sending my best wishes for a blessed summer. I was thankful to get away this Christmas to Colorado and New Mexico to visit my near and dears, and take a little break before this busy season before us begins ! Fred Wackerle is our 4th artist in the popular ART WINE MONDAY series that we have begun with Tavolino’s Ristoriante in Plaza Colonial. This next Monday January 10th Fred will present his new oil works on paper from 5:30-7pm in the private dining room. A featured Italian winery will host a tasting, and gourmet hors d'ouerves complete a fun evening out. Fred and I both will be there to meet and greet. There is a $10.00 charge for this event, paid at the door of Tavoilino’s. I hope you all a blessed New Year full of excitement and adventure ! And that I get to meet some of you who visit my website, read my blog or Facebook this year. We had two back to back October shows, October 2nd was the Rose Johnson retrospective. Titled "The Last Rose Of Summer", it was in honor of the fabulous art of the late Rose Johnson on what would have been her 50th birthday. Held at the beautiful La Paloma , I was blessed that Rose's parents Eric and Margaret were able to come out from Ohio for this special event. It was a statewide search to gather many of her finest pieces of Folkloric, whimsical and fantasy oil paintings. Bisbee classical guitarist john Rodriquez performed for our very special occasion. Then on the 22nd we celebrated, "Romantic Lands and Figures" a two person show featured the impressionism of both Roger Alderman's landscapes and Zulia Gotay de Anderson's figures. Both similar color palettes gave the romantic edge to the work. Our favorite jazz singer Kari Shaff joined us with her trio for a lovely evening reception. I can't believe its almost Thanksgiving ! There is so much to be grateful about. I thank you for visiting my website and reading my blog! Next week on Monday November 22 from 5:30 to 7pm, we are having our 3rd monthly, ART WINE MONDAY at with our neighbor Tavolino's here in Plaza Colonial. This month our featured artist is Tom Murray of Santa Fe who will be honored with a private reception including a wine tasting and gourmet hors ' d'ouerves at Tavolino's. A $10.00 donation is required. I can't believe that it’s been almost a year since we opened in our new location here at Skyline and Campbell ! I feel really blessed to have such wonderful people to work with in Plaza Colonial. My new neighbors like Massimo ( who's delicious food is to die for... ) at Tavolino’s. Dara Davis, next door and under the copper dome, one of Tucson's best "really western designer" for home at Sunset Interiors and Walter Gaby, who's fabulous array of fine rugs and carpeting at Rug Resource, have really helped round our our destination "art and design" center . Friday, August 20th we are celebrating our first year in our new location ,with "A Sizzling Summer Sensational Show"! From 5-8pm. Several of our artists will be present to meet and greet. We will have wine and food with music by the Kari Sharf Trio. This great little jazz trio will enliven our celebration party.... Please come by and say hello if you are in the neighborhood ! 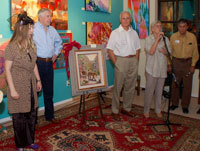 I will be checking in regularly to update you on the gallery artists and happenings. 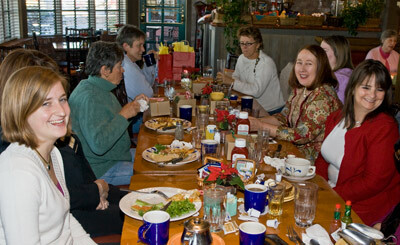 We just had our annual gallery helper breakfast, A good time was had by all. Jane Hamilton Fine Art is delighted to receive a new delivery of Taos artist, John Suazo's sculpture. Looking forward to an active 2008.